From ProSales. By Scott Morrison. 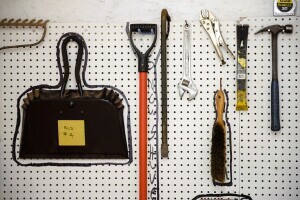 Lean principles include keeping tools organized and in designated spaces so they’ll be easy to find every time. Let’s recap: Part 1 of this series introduced key concepts for making Lean principles stick. Part 2 went to Curtis Lumber in New York State and showed how embracing Lean ideas boosted its performance. Then in part 3 we visited Mathew Hall Lumber to see how it handled “The Big One.” We also served up a glossary of key terms. Now let’s turn to some uncomfortable truths that could hinder your 5S/Lean journey. You must determine who needs to go in order to get 5S/Lean into the culture. That person who has been “indispensable” forever because he or she has a special skill? If that person isn’t on the bus, they have to go. All the bosses quoted here have made significant, and painful, changes in their teams in order to get 5S/Lean to move forward. You must spend time getting your workforce up to speed, testing changes, and revising processes; celebrate wins and move on after failure. 5S/Lean won’t work if you’re just giving it lip service. In that case, people won’t buy in. See what’s working and where to spend your time/effort facilitating improvement. This is not a mail-it-in step. Remodeling an old building or erecting a new facility without a connection to the PDCA Cycle will not solve your problems. Fix the problems on paper and in pilot programs first to see if your changes can work; implement those changes with minimal investment, and monitor for performance improvement. Then approach how to invest capital to support that growth. The true work of 5S/Lean is facilitating continuous cultural change. And that’s when you’ve graduated from Lean 101 to Lean 201. SLAM! Class dismissed. Lean 201, Part 3: Using Lean Principles to Make Big Changes.